The question that Harvard put forth at last night's meeting was "Is having Stadium Way better than not having Stadium Way?" The goal stated for creating Stadium Way is a noble one - reduce cut-through traffic on Windom Street and create an road other than North Harvard St to connect Cambridge St and Western Ave.
2) Difficulty exiting the Mass Pike westbound to go to Allston, Brighton, Cambridge, or Storrow Drive. 4) Poor pedestrian and bicycle access on Cambridge St that cuts off the neighborhood from the river. So why, at the beginning of this fantastically huge development project, is the proposal so modest? As buildings and new roads (like Stadium Way) get built it will only make it harder and more expensive to make the fundamental improvements that this area so badly needs. So I think the real question is "How many of our biggest transportation problems should we try to fix before starting one of the biggest developments in Boston history?" There is a lot to say about the meeting last night, but here is a snapshot. 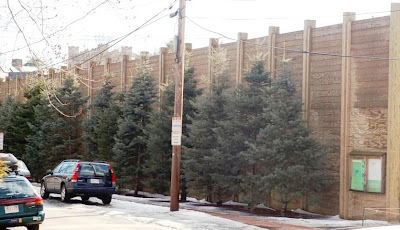 Harvard built a first-class barrier wall and planted trees on Hammond Street in Cambridge. "Linking partying to violence in Boston, the City Council yesterday called for stiffer fines against loud parties among other measures to curb the wave of violence hitting the city. Linking partying to violence in Boston, the City Council yesterday called for stiffer fines against loud parties among other measures to curb the wave of violence hitting the city. Councilor-at-Large Sam Yoon proposed the city raise its fine -- currently $300 -- for noise violations as a means of curbing late-night partying, and he suggested the Council create an exploratory committee and hold a hearing to further investigate the problem." Check out Mike Pahre's Brighton Community Blog. Wednesday at 6 at the Honan Library is a meeting to discuss construction mitigation with Harvard. 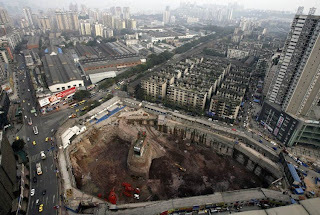 One issue is the appearance of the areas where the existing buildings will be demolished and where construction will happen. 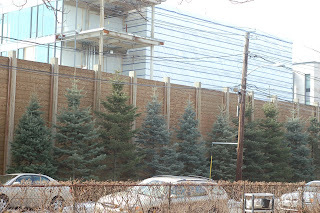 In Cambridge Harvard built these nice 20' walls and planted mature pine trees between the wall and the neighborhood to block noise from the construction site and make the neighborhood look better. It would be great to see this on Western Ave, Travis St, and elsewhere. Past separated from future? - The Boston Globe: "As historic sites go, the weathered sign outside the Dunkin' Donuts at the corner of Market and North Beacon streets isn't much, unless of course you're a big fan of neon. But recent rumors that the sign might not survive a planned renovation of the nearly 50-year-old franchise have raised, well, not so much protests as concerns." Faded markings make for a hazardous crossing in Brighton - The Boston Globe: "Tipsters Elizabeth Rothwell , Liza Wittkopf , and Sarah Diffenbaugh are social work interns from Boston College's School of Social Work who say the city has got to do something about a scary, even deadly , situation in Brighton. The trio works at the Covenant House, a 242-unit affordable housing complex for senior citizens at 30 Washington St."
Something's happening in Barry's Corner! Now here's someone who is REALLY standing up to stop development! The Boston Minstrel Company is holding its 15th annual fundraiser party on Saturday, April 21 at 7:30 PM. The proceeds will benefit our musical outreach to Boston area homeless shelters and residential facilities as well as the MCI-Framingham prison for women. The event will feature music by the Knuckleheads rock & roll band and the Boston Minstrels, led by North Brighton's own Tim McHale, Artistic Director. Come one, come all if you like to sing, dance, and celebrate! There will be live and silent auctions, raffles, a light dinner buffet, and a cash bar. 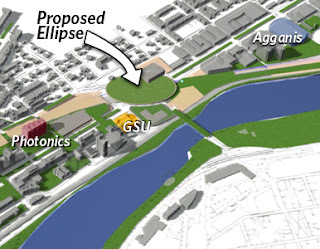 Study Sees New Campus Center Near BU Bridge: "...the urban planner has proposed a key concept for the physical future of Boston University: a campus stretched along Commonwealth Avenue whose center is a grassy ellipse built over the Massachusetts Turnpike near the BU Bridge. " Boston University wants to transform a traffic-snarled area of Commonwealth Avenue near the BU Bridge into a new heart for its campus, including such features as a public transportation center, sidewalk cafes, stores, academic buildings, and housing. 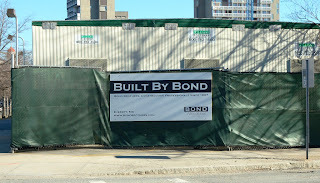 University officials yesterday released a rough outline for redeveloping the BU Bridge area, a plan they see as a continuation of a $450 million building boom they began on their west campus nearly a decade ago and have almost completed. What we think: Residents need to be more understanding"
How safe can bio-research be? In a coindence of timing, on the same day that we had a meeting with Harvard about the bio-research facility that they want to build on Western Ave, a research building operated by Boston University was evacuated. One of the questions that was asked, but not answered, at the meeting last night is the Biosafety Level of Harvard's planned building. 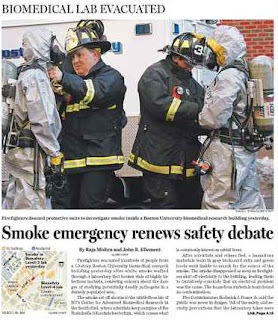 Firefighters evacuated hundreds of people from a 10-story Boston University biomedical research building yesterday after white smoke wafted through a laboratory that houses vials of highly infectious bacteria, renewing concern about the danger of studying potentially deadly pathogens in a densely populated area. Click here to download this document about environmentally sustainable techniques that could be used for this project and the surrounding neighborhood. Task force votes to support new ED - Allston/Brighton TAB In a 7-1 vote, the St. Elizabeth’s Task Force decided Thursday to officially support the hospital’s plans to build a new Emergency Department at the corner of Washington and Cambridge streets in Brighton. Starting off on a better note - Allston/Brighton TAB: The Gardner School launched a music program in its kindergarten and special needs classrooms after the winter vacation, giving 42 children an opportunity to learn about music on a weekly basis, according to Julie Bott, the director of extended services at the school. This has been made possible through a partnership with the Community Music Center of Boston. Next year, Bott said, the school is hoping to bring music classes to more children. Ton Chin, 73, of Allston said he prefers to walk outside. But, in the winter, he has nowhere else to go. So, every morning, he and his wife, Kum, lace up their white sneakers, drive to Watertown, and walk the mall for an hour. Chin said he doesn't know what he'd do without it. "I come here every morning," he said. This story brings to mind a conversation I had recently with an Allston resident about Harvard's athletic complex and its Gordon indoor track in Allston. The track is only used for competition six days a year and probably there are times during the week when the undergrads or other Harvard people who would use the track are in class or busy doing other things. It would be a nice thing for members of the community like Mr. Chin to be able to walk at the Harvard track instead of driving to Watertown. Of course Harvard doesn't have to do this, but it would be a nice way to be a good neighbor. In some small way it would be a symbolic way to compensate the community for inconvenience's caused by events like the high school hockey tournament last week that put Allston residents and others in crazy traffic backups (North Harvard St northbound backed up from the Stadium to Cambridge St!). Is there a public right (or moral reason) for access to art? Continuing to think about museums and their role in society, this story is about the controversy in Buffalo as the Albright-Knox Art Gallery begins to sell at auction several ancient works from its collection. The article notes that the endowment of the Museum of Modern Art is $650 million, which is only 13% more than the endowment of the Harvard Art Musuems. There is also this letter to the editor whose author mentions "the rights of future generations of museum visitors and the community to enjoy the treasures of the collection." Gateway to a better future - The Boston Globe - An interesting 3 part editorial about public high school medicine, science, and engineering education, Boston's residency requirement for city employees, and Boston Public pilot schools. Campus liberals far prefer the soft issues of racial and gender diversity to such hard issues as the effect on American working families of cheap foreign labor or the gross inequities of a public school system funded by local property taxes, or, closer to home, the failure of their own institutions to recruit and support more talented students with no money. I have met very few faculty members who, even as they agitate for far-flung social causes, care to look closely at the admissions policies of their own institutions. Our colleges and universities are following rather than resisting the national trend toward a widening disparity between rich and poor. This is true not only in how colleges admit their students, but in their internal structure (presidential compensation has crossed the million-dollar threshold in several cases), and in the wealth of leading institutions relative to their competitors (the annual return on Harvard's $30 billion endowment now exceeds the entire endowment of some of its Ivy League rivals). On the bumper of my Saab. 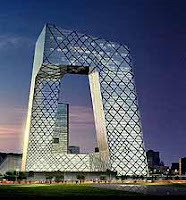 A new design energy has been building around the world. It's generating products and places that respond to a positive fact of the 21st century: people live longer and survive more than ever before. Call it design for social sustainability, universal or inclusive design - it's about all of us designing a world that works for each of us. Harvard has 260,000 pieces of art and acquires up to 3,000 new objects a year. The museums’ endowment was $575 million as of January 1. 99% of the collection sits in storage. Why doesn't Harvard want to use more of its land in Allston to build museums that would let people see much more of what is sitting in storage? The Isabella Stewart Gardner Museum has been studying how schoolchildren can learn from art. This is the type of educationally focused involvement with the community that the Harvard School of Education which someday may be locted in Allston and the Harvard Universtiy Art Museums might consider. One group of students will focus on Allston this semester. For them, understanding Harvard’s presence in the area and how it interacts with the community—the future site of University’s new more than 200-acre campus—isn’t a casual interest: their grade depends upon it. And for Harvard planners, whose proposal to build a new art museum in the area was stymied this month in the face of community outcry, Stockard’s teaching may prompt valuable lessons. Following Stockard’s logic, understanding and integrating Allston’s identity into their plans should be a critical concern of Harvard planners as they work out the kinks of the master plan. Gordon said that the University had to “do better than just being fair and transparent” in its negotiations. A facilitated workshop on Harvard's Institutional Master Plan documents. This workshop will analyze Harvard's institutional master plans with respect to suggested planning standards for Allston Brighton. Harvard announced at the February 28th Harvard Allston Task Force meeting that the University is pushing back review of the Western Ave. Art Site and the overall Institutional Master Plan at the request of our community, and we will focus on getting the review of the Science Center back on track. The previously scheduled March 12th & March 28th meetings have been cancelled and we have scheduled a series of March meetings, the first two focusing on the proposed new roads. Harvard published this new information last week about the art building/museum/warehouse. Its a tough document to read becuase the document has a 30"x40" page size, but here are some initial observations. The Public Education room that was in the basement has moved to the first floor. The space freed up in the basement is used to enlarge the "multi-purpose" room which now has space for 300 people for lectures or 200 people seated at tables. A catering kitchen and table/chair storage spaces are mentioned. It would be nice to have this space available to rent for Allston and Brighton functions, but that would only happen if the rental price would be affordable to our community groups. Rental of the courtyard at Harvard's Fogg museum starts at $5,900. Is this what will eventually happen here? Seven families on Lori Lane -- who together make up the entire population of the dead-end road -- are selling their homes en masse for a combined asking price of $4.2 million. Their motive? To get out before a massive commercial development being built on Route 105, directly across from Lori Lane, boxes them in, further changing the nature of their once rural neighborhood. Roommates handcuffed, beaten in Brighton break-in - Local News Updates - The Boston Globe: "Boston police are searching for three suspects who wore masks and broke into a home in Brighton overnight, injuring two people." If you live, work, or attend school within 100 yards of a roadway carrying 100,000 or more vehicles per day, you are more likely to suffer from cardiac or pulmonary disease. California state law restricts the siting of new schools within 500 feet of a freeway or an urban roadway with 50,000 vehicles or more per day. The California Air Resources Board recommends caution before siting residences, day care centers, playgrounds, or medical facilities within those same distances. Map showing the busiest intersections and interchanges in Greater Boston. Allston and Brighton is a swarm of red and orange. A-B low on BPD's priorities, Davis says - News: "Crime problems in the Allston-Brighton area will have to take a back seat to more pressing problems, such as gun violence and turf wars in other parts of the city, for at least the next few years, city officials say - although they said they are taking the rising number of assaults reported in the area seriously. Crime problems in the Allston-Brighton area will have to take a back seat to more pressing problems, such as gun violence and turf wars in other parts of the city, for at least the next few years, city officials say - although they said they are taking the rising number of assaults reported in the area seriously." WEDNESDAY MARCH 14, 2007 10:00 A.M.
WEDNESDAY MARCH 21, 2007 10:00 A.M. Tonic - 1314a Commonwealth Avenue - extend the closing hour From-1:00 A.M. To- 2:00 A.M.
From Ben "...Dear Brent: I, for one, sobbed hot tears when I found out there would be no art museum. It promised to be a wonderful place. Perhaps you could even have taken your children there, and lifted them up and down to get a workout." From Harvard Alum '04 "...Harvard should be able to do you whatever they want with the land that they bought, and not have to kowtow to a group of snivelling do-gooders who wield the power they accidently hold by virtue of decrepit zoning laws like a big stick..."
As a gubernatorial candidate last year, Deval Patrick delighted environmentalists with a pledge to spend an extra $10 million his first year in office to begin fixing the state's long-neglected parks system. But to the dismay of park advocates across the state, the budget Patrick released last week only increased funding for parks by about $740,000. This is particularly relevant to Allston and Brighton, where so much of our parkland (the Charles River and reservoir) is owned and maintained by the DCR. The Crimson in today's Allston editorial looks at the plight of undergrads who might someday live in Allston. They make several references to "the Quad", which is the group of dorms or Garden St. Here is a map of the Quad and the Wikipedia description of it. 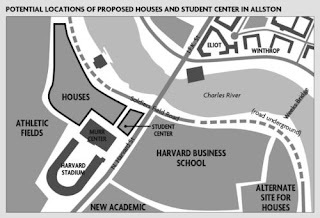 The editorial mentions that the new undergrad dorms in Allston would replace the undergrad dorms that already exist in Cambridge in the Quad. City Weekly story in today's Globe about efforts to buy the former Presentation School building to create a community center with a preschool, after-school programs, and adult education. Harvard's Allston Expansion "by the numbers"
The PSF needs financial support to acquire the former Presentation School building. In particular, our Community Spirit 1000 campaign seeks to obtain $250 from 1,000 Allston-Brighton businesses and individuals. Our community campaign goal of $250,000 will help to finance the $1 million purchase of the building. Combined with corporate and foundation support, we are confident of our ability to transform the building into a community-based education center providing vital programs and services for children and adults. Donations can be made directly on-line through the Presentation School Foundation Web site at psf-inc.org/donate or by mail at Presentation School Foundation, P.O. Box 35834, Brighton, MA 02135. All donations are tax deductible. "I think the process is in trouble because Harvard has submitted too many documents," said Ray Mellone, chairman of the Harvard Allston Task Force. He described the process as "chaotic." Local elected officials, including state Reps. Michael Moran and Kevin Honan, state Sen. Steve Tolman and Boston City Councilor Jerry McDermott, have objected to what they consider Harvard's ad hoc approach to planning the museum. They sent a letter to the BRA last week, asking that the museum proposal be removed from the proposed amendment to its old master plan, and instead consider it as part of the university's new master plan submitted in January -- a move that would likely significantly delay the project. "They clearly haven't followed the process," Honan said. "And it's up to the BRA to say this is not correct." How does Harvard estimate its economic impact? In "The Plan for Harvard in Allston" it says that "Harvard’s Allston Initiative is expected to generate approximately 14,000 to 15,000 jobs over the next 50 years." That's an extraordinarily precise estimate in an otherwise very general document. How will the University community still know it’s Harvard? By employing contemporary expressions of the cherished architectural and landscape devices, such as intimate scale, courtyard buildings and tree canopies. What does "intimate scale" mean? At least for those of us who spend more time looking at the outside of Harvard building than we do inside them, I don't see much intimacy in the scale of what Harvard is doing here. Example 1: One Western Ave. Example 2: The 125 foot tall Science Complex that is the subject of tonight's meeting. In the dictionary one definition of intimate is "of a very personal or private nature." That makes sense. Harvard's new campus does seem very private and restricted to people with a very close association. So maybe that's what they have in mind. it would be nice if the university supported the local merchants in harvard sq instead of competing with them before expanding and taking over allston. Another arrogant article from the Ivory Tower, trying to teach the "local folk" what's good for them. 1) The Master Plan as written, far from "balancing" the "needs and desires" of the Allston community, makes almost no reference to them. 3) Evidence that your wildly inflated estimate of job growth will actually benefit the community pales beside the fact on the ground of economic depression caused by Harvard's purchase and closure of many businesses outside the Master Plan area, for unspecified purposes. 4) Perhaps parochialism is unavoidable on both sides of the river, but the 'coherence' of Harvard's designs is not necessarily more urgent than the well-being of 10.000 people already living in the area. City to publish trash scofflaws' names - The Boston Globe: "In an effort to persuade trash scofflaws to pay their bills, the city today begins trying a new tactic: shame." Menino also recently filed a home-rule petition asking the Legislature for tools to help make garbage violators pay. The proposal would allow the city to place liens on the property of owners who have not paid bills for illegal dumping, site cleanliness, and improper storage of trash. The owner of a distinctive house at 1954 Commonwealth Ave. may not be able to move forward with his plans for the property, which at various times have involved either razing or moving the structure to make way for condos. Today's editorial in The Harvard Crimson notes "how wide the gulf between Harvard and the Allston community has become" and hopes for the cooperation and constructive relationship that we all want to see. Free tax clinic returns - Allston/Brighton TAB: "Free tax preparation is available Tuesdays from now through mid-April at the Allston-Brighton Resource Center, 357 Western Ave., Brighton, and at 22 other sites around Boston. Appointments are preferred, but walk-ins are welcome, too. Call 617-562-5734, or visit bostontaxhelp.org for more information." A report from this week's Green Gathering of the Allston Brighton Green Space Advocates. The Allston Brighton Green Space Advocates meet the third Wednesday of every month from 7:00PM - 9:00PM at the ABCDC. The Green Space Advocates may hold outdoor meetings in our neighborhood open spaces. For more information, contact Heather Knopsnyder at (617) 787-3874 ext. 215. "The discount has been funded largely by the proceeds of the $75 million sale of turnpike land in Allston to Harvard University in 2003." It is nice to save a quarter at the Mass Pike tolls, but it strikes me as strange that this is how the $75 million from Harvard is being spent by the State. 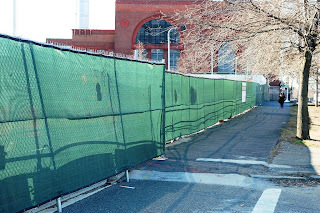 Seems like there are other things in Allston that the Turnpike could fund (noise barrier walls along the Pike in Allston, maintenance and improvements to the Franklin St overpass that crosses the Pike that is usually a disgusting mess, tree planting or other general beautification around the Pike land, targeted toll discounts for Allston residents, air pollution monitoring and remediation for people living near the Pike who might be affected by all the tailpipe emissions, etc.) that would be more relevant to the situation. The existing toll discount is a nice little benefit for thousands of people from all over the state. I don't think I would expect a benefit if the Pike sold land it owns in Framingham. Some of you might be interested in a new email group that has formed to discuss an important issue in the community. The http://groups.google.com/group/BC_Neighbors_Forum promises to be a valuable resource for community members to talk about BC's expansion plans. The Harvard Crimson's report on last night's Task Force meeting and the art building delay. "Harvard and Boston Redevelopment Authority officials said last night that they would hold off on plans to build an art gallery in Allston, after local residents and politicians spoke against the proposal and expressed concern that they have been left out of the decision-making process."